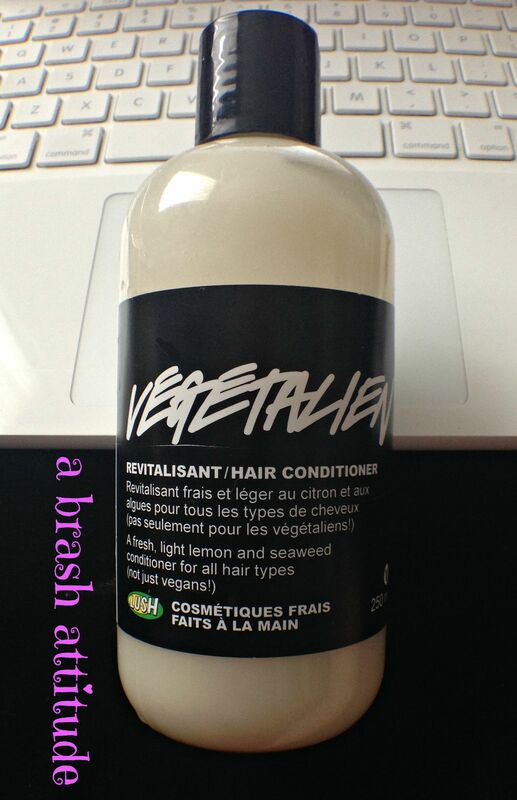 Continuing on with my Lush reviews (mini haul post here, Catastrophe Cosmetic fresh face mask here and Hair Doctor hair and scalp mask here), today I have the Rehab / Restauration Shampoo and Veganese / Végétalien Conditioner. My hair is thick, wavy and prone to frizz in humidity and dryness at the ends. It wants to be gigantic. And I have a sensitive scalp (or more accurately I’m sensitive head to toe). Bleach, dye, styling products and heat can really take a toll on your hair’s health. 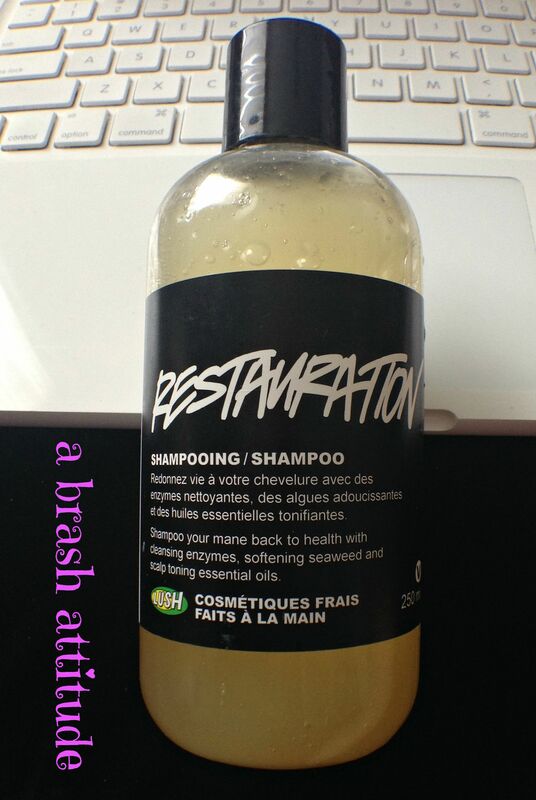 Treat your damaged hair to some serious recovery time in the shower with Rehab shampoo. Rehab is about bringing your hair and scalp back to life and repairing it with an array of nutritious ingredients. A blend of fresh fruit juices clarify hair and scalp with active enzymes, while herbs work their magic on tired scalps. It doesn’t take long for this shampoo to restore your hair’s vitality! The key ingredients are oils (olive, jojoba and almond oil), the fruits (papaya, mango, pineapple, and kiwi), and the essential oils (lavender, peppermint, rosemary and juniper). The shampoo lathers really well, and makes my hair and scalp feel super clean without feeling stripped, or without feeling like it has left a residue. The scent is amazing, I really smell the pineapple, lavender, mint and rosemary (thankfully I don’t smell the papaya – I have an aversion to papaya because it smells faintly of vomit to my nose – tmi, maybe). My only complaint is that there are alcohols and parabens in there, and I try to avoid them as they often irritate my poor sensitive skin. So far, no adverse reaction, but I’d be a lot happier if they weren’t in there. Would I buy it again, yes, but if I can find a similar product that doesn’t have alcohols or parbens, then I will choose that instead. Vegans and fine haired folks around the world rejoice! Veganese is our lightest, conditioner that takes hair without volume and makes it go va-va-VOOM! The majority of LUSH products are vegan, but making a vegan conditioner without lanolin took us a few years to perfect. It was worth the wait. We use agar seaweed gel as a natural hair softener instead of lanolin, and blend in generous helpings of lemon oil to create the perfect vegan conditioner to leave you with tons of gloss and shine. We also added in the scalp soothing effects of lavender and rosemary to keep you sorted on top. The key ingredients are agar agar (seaweed), lavender, rosemary and lemon. The really does help add shine and gloss to my hair. I love the citrusy, lavender and rosemary scent. I don’t use a hair dryer in the warm months to give my hair a break, so the lightness of the conditioner is fine. But once it gets cold and I start blow drying my hair, I think that I will need heavy duty conditioner instead of this one. Again, my complaint is that there are parabens in this conditioner. Would I buy it again, yes, but if I can find a similar product that doesn’t have alcohols or parbens, I will choose that instead. The Rehab shampoo is available in three different sized bottles (100, 200 and 500ml, ranging from $13.95 to $39.95 CAD), and the Veganese conditioner in three different sizes (100, 200, and 500ml, ranging from $9.95 to $32.95 CAD). Disclosure: I purchased these products. This morning on Breakfast Television they were at the LUSH factory! It was really neat to see them making bath bombs and also the sea hair spray – all by hand! They employ 400 people there and for the Christmas rush, they go up to 700 people! I have never tried Lush’s liquid shampoos (only the solid shampoo) but they so seem nice, and not overly pricey. Cool – I will see if I can watch it online! Yeah – my nose is sometimes weird – jasmine smells like pee to me sometimes as well. So yeah, haha! Jasmine scent can vary so much, I like some of them but not all. Yay! What a coincidence though that they featured it and you posted about them too! If I lived near there I would totally apply for a job, I’ve always wanted to learn how to make soaps and bath stuff! I bet it smells amazing in there! Me too – some of their stuff doesn’t have parabens thankfully. I am so surprised that they contain parabens:( Thanks for the info & review !!! I was too, but not all of their things do thankfully!